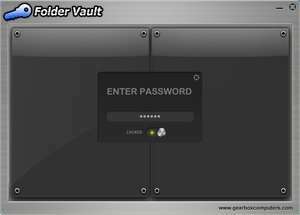 Folder Vault is a file protection tool which prevents unauthorized access to data you deem sensitive. It encrypts data you select and puts it behind a master password which must be entered in order to access the data. Upon initial installation, Folder Vault creates a default folder where encrypted data is stored and within the folder you may place any type of file you would like to hide from prying eyes. The actual application can run behind the scenes in stealth mode to avoid being detected by hackers. For security reasons, you should also check out the Folder Vault download at LO4D.com which includes virus and malware tests. Additional screenshots of this application download may be available, too. 1.7 out of 5 based on 11 ratings.